HOMANN -Globi Coelestis in tabulas planas redacti pars I.
HOMANN,J.B. / DOPPELMAYR,J.G. - Globi Coelestis in tabulas planas redacti pars I.
Globi Coelestis in tabulas planas redacti pars I. - HOMANN,J.B. / DOPPELMAYR,J.G. Title : Globi Coelestis in tabulas planas redacti pars I..
Map maker : HOMANN,J.B. / DOPPELMAYR,J.G.. Size : 19.4 x 23.0 inches. / 49.3 x 58.5 cm. 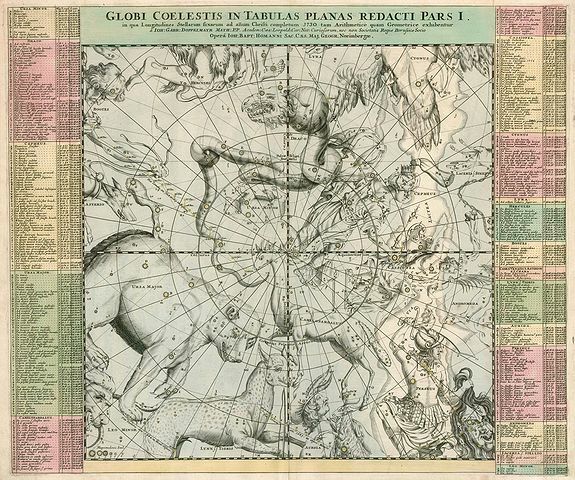 Description :Celestial map of Ursus major, Draco, Cepheus,..